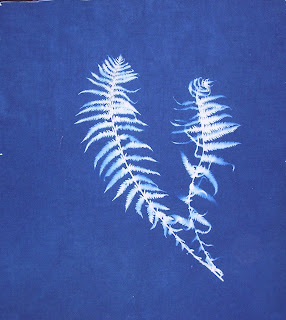 Cyanotype or Blueprinting or Sunprinting. This is called by many names - Cyanotype is correct. I am teaching this at the Saskatchewan Stitches Conference for the Haus of Stitches in early June. I also have an article published on Alternativephotography.com about making a quilt with cyanotype fabric. 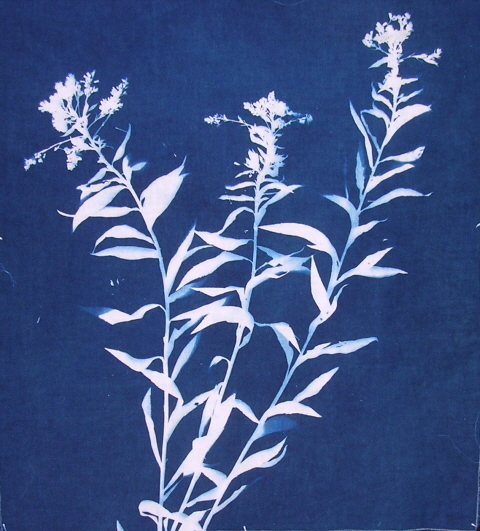 Cloth Paper Scissors tells all about cyanotype in the March/April 2010 Issue No. 29 by well known mixed media artists Linda Blinn and Jane Lafazio. Even Martha Stewart has gotten into the picture in her magazine "Martha". Does this mean I will soon be famous with this upcoming trend. I have been teaching a class using this technique since 2004. I can't wait until warm weather so that I can get outside and 'blueprint' madly.